how long would you need to live in a jersey for it to become a favourite, or even the favourite? and do folks even have favourite jerseys anymore? in a world awash with the philosophy of disposability, perhaps cycle apparel need only inhabit a designated portion of the wardrobe and make itself readily available whenever the opportunity for a bike ride presents itself. what constitutes the fabric of the jersey at the top of the pile may not matter much. polyester or lycra, however you want to name it, surely has a generic feel about it, three rear pockets, a short front zip and a tendency to exhibit little pooks in the material after several washes and wears. and there's another aspect about defining a favourite jersey; wearing it interminably is one thing, but how does it fair when you wash it? several times? favourites require to be faithful, it's a (perhaps unfair) conditioning we place upon them. the reasoning is logical: if it's a favourite jersey, you want it to hold its own in esteemed company. there can be no faith in favourite that looks shabby. well, actually, that's not true, for it is written that a jersey that has experienced several years of road rage will have acquired character. now character is an indefinable. everyone's definition of character is going to differ; often by millimetres, but possible by a huge gaping chasm. but you would surely broker no argument that several years of polyester will have little in the way of character. saggy patches and pooked stitching do not a summer make. search through your extensive collection of photographs depicting coppi, anquetil or merckx fending off photographers and well-wishers in the post race scrum. i agree that the wool jerseys they all wore will hardly have made it past the baby stage, but the wear and washing that those garments will have experienced in their short careers, will likely shame those we've had for many a year. so wool it is then. returning to the subject of favouritism, a secondary unique selling-point would appear to be necessary. let me explain. suppose all jerseys were made in black (i'm thinking expressly of wool here; though it may have been a subtle shift, the conversation has now eschewed polyester), and that wordrobe i mentioned earlier was filled to overwhelming with examples of same. how could a favourite be possibly defined? in fact, given such a scenario, what would be the point of even having a favourite in the first place? surely that would constitute eccentricity? thus, by definition, this favourite jersey (i can see you are warming to my theme), ought to have a secondary motive in its armoury, one that links it with another favourite, perhaps a rider, or one of the makes of bicycle in the bikeshed. and that's kind of where i come in. or, more to the point, where i am at present. 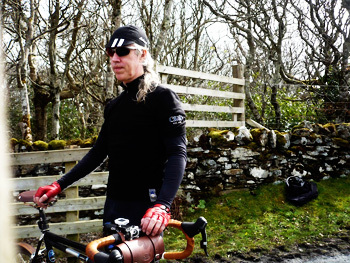 i have, in the past, lovingly described the original wabi woolens jersey (in luxurious espresso hue) as the rolls royce of merino cycle jerseys, and in the process of it being a favourite jersey, i have found no reason to rescind that published statement. were it necessary to come clean, the espresso colouring alone would do it for me, but the jersey is of such a robust and comforting resolution that both pre, during and post ride, it is a wonderful garment to inhabit. you must surely know of which i speak? those days when footering about the house for an hour or so prior to even putting on a pair of cycle shoes, dressed in the jersey de jour seems perfectly acceptable. and on returning, slouching about for a similar period of time before becoming a civilian again seems like normality. it's just that sort of jersey. in a cruel twist of fate, the concept of favourite is a variable, susceptible to daily moods. thus, what was yesterday's favourite may not be today's, particularly if yesterday's is in the wash. and even favourites need to be at least temporarily retired at some point, particularly if there's a change in the weather. the espresso wabi is of long-sleeves and substantial construction, far too cosy for impending sunshine. so while it remains the/a favourite, its sterling service over the winter months has earned it a period of respite. harth huffman is a man of perspicacity; he has the astuteness to realise that the aforementioned change in the weather happens every year, and there may be room in our psyches and wardrobes for a less substantial merino knit, one that will accompany the fortunate rider through the months when it doesn't get dark early in the evenings. this range is referred to in wabi terms as the sport series. those who have been paying attention will realise that a long-sleeved example of the latter has already inhabited these yellow and black pixels, and acquitted itself with distinction, as indeed it continues so to do in day to day cycling life. you may also have picked up on the fact that my regular bicycle of choice is a sparkly black chris king cielo, a velocipede that likely needs no introduction, but one that has now gained an important ally in the sartorial stakes. launched at the north american handbuilt show in february of this year, cielo are now able to offer a cycle jersey originating from the same city (portland, oregon), also constructed in the usa, and equalling the quality of the handbuilt cycle frame and its attendant components. 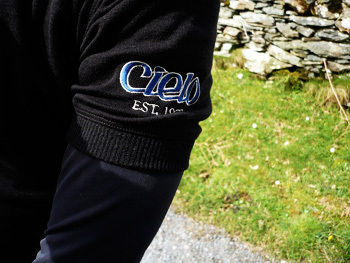 on the left (short) sleeve, just above the ribbed wool cuff, is an embroidered cielo logo, subtly complemented by a logo'd tab sewn to the left side of the hem. it is a wabi woolens jersey, even though such distinguishing and confirming marks are absent from the knit. i just know. merino is now an everyday part of cycling; ubiquitous would not be too strong a word. but there is merino, and there is merino. this is the latter. the collar is also ribbed, most pleasingly, and offers safe haven for a half-length zip. the hem is elasticated, plied with that silicon gloop that stops the ineffective lycra of a pair of shorts from allowing it to ride up while doing its job in the saddle. there are the three obligatory rear pockets, sited almost half-way up the back of the jersey and joined by a zipped security pocket outboard of the central, ipod enabled pocket. these pockets are not as elastic in their intention as more regular fair, but will retain their good looks well into the next decade. that said, it's astonishing just how much can be successfully crammed into what seems such a sequence of small spaces. cielo and wabi woolens: it has favourite written all over it. the cielo merino team jersey retails at $180. if a cielo does not reside in your bikeshed, you might wish to consider a regular sport series wabi woolens jersey. the short sleeve costs $145, the long sleeve at $160. This website has no professional affiliation with cielo cycles, nw nela st. portland, oregon, usa.